she – Official website » Blog Archive » New Album orion Released. 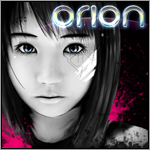 orion is now available for purchase on iTunes, AmazonMP3 and other online music stores. The release is also available as a DigiPak CD in Japan from Pony Canyon. If you are interested in the albums storyline and character you can visit the official orion website here with story clues and downloads. For those of you who want to buy the DigiPak release but dont live in Japan can import it via Japanese online music stores such as Yesasia and HMV Japan.